Hydraulic fracturing is the subject of a market research study recently published by the market intelligence company Transparency Market Research (TMR). The report states that the global hydraulic fracturing market, worth US$38,320 mn in 2013, will rise to US$66,059.42 mn by 2022, exhibiting a moderate, yet a positive 6.12% CAGR, between 2014 and 2022. The report is titled “Hydraulic Fracturing Market - Global Industry Analysis, Size, Share, Growth Trends, and Forecast 2014 - 2022”, and is available at the company website for sale. According to the report, volume-wise, the market had a valuation of 21.34 MHHP in 2013. Expanding at a 5.30% CAGR over the report’s forecast period, the market is projected to rise to 33.97 MHHP by 2022. Technological advances in the past few years have led to an increased rate of adoption of hydraulic fracturing technique for the exploration and production of oil and gas from unconventional reserves such as tight sand, coal bed methane, and shale formations. Nine out of 10 natural gas wells in the U.S. currently employ hydraulic fracturing as the most potent way of extracting oil and gas from unconventional resources. Used commercially for the past 65 years, the technique and its use has found an increased rate of adoption owing to the numerous benefits offered by the combination of the technique with horizontal drilling and use of cutting-edge technologies for an easier and increased production of oil and gas. 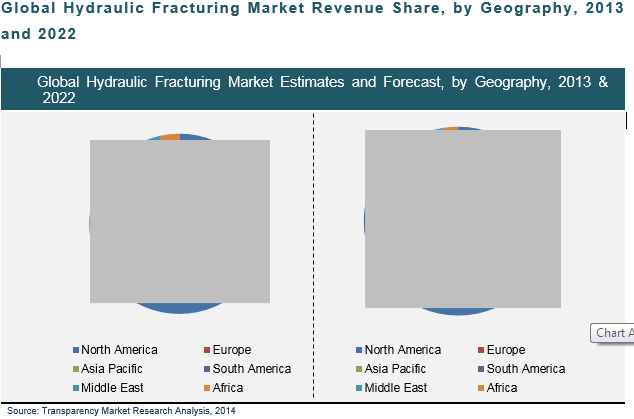 The report segments the global hydraulic fracturing market on the basis of three criteria: technology, application, and geography.On the basis of technology, the market is segmented into sliding sleeves and plug and perf. Of these, plug and perf is the highest grossing and the most preferred technology segment of the market owing to their flexible nature and widespread use in wellbore completion activities. The application segment of the hydraulic fracturing market is further segmented into conventional, shale gas, and others (tight gas, tight oil, coal bed methane, and shale oil). Of these, the segment of shale gas is currently the largest market segment owing to its enormous reserves, especially in North America. In 2013, the segment of shale gas accounted for a sizeable 32% of the global hydraulic fracturing market. Geographically, the market is segmented into North America, Asia Pacific, Europe, and the Rest of the World (RoW). Of these, the U.S. market, one of the largest regional hydraulic fracturing markets of the globe, is expected to rise to a valuation of US$30,936.29 mn by 2022. Asia Pacific, especially Australia and China, which have abundant unconventional resources of oil and gas and vast reserves of shale gas, is aiding the growth of the hydraulic fracturing market in the region. Furthermore, China has the second largest reserves of shale gas after North America and is capable of becoming the largest producer of natural gas in the future years. However, the market in China features a strict regulatory framework and hydraulic fracturing is not permitted without government licenses. The report also presents a detailed overview of the competitive landscape of the global hydraulic fracturing, and features the detailed business profiles of some of the key vendors in the market, including Baker Hughes Inc., RPC, Inc., FTS International, Inc., Schlumberger Limited, Halliburton Company, Calfrac Well Services Ltd., Nabors Industries Ltd., United Oilfield Services, Inc., Trican Well Services Limited, and Weatherford International Ltd.